A Tu Lado's programs create long-term change by training local health workers who are invested in their community. Our graduates care for thousands of patients, and many become instructors committed to sustaining our impact long into the future. Since 2011, A Tu Lado has trained 184 students in total. Here are a few of their stories. An ideal educational program inspires change beyond the individual student, and in Augusto's case the ripple is easy to see. Although already a practicing physician with a community clinic on the outskirts of Cochabamba, Augusto suspected medical school did not prepare him for everything he hopes to do. "What I learned in university was too theoretical," he explained. "But the method used by A Tu Lado (ATL) is experiential - start at the beginning and go through step by step." Looking back on the impact of ATL's June 2012 course, Augusto told us, "After doing the scenarios enough times, I can re-live them in my head, and it's easy to re-do." His hands-on experience proved a pivotal asset when, shortly after graduating, he applied to work as an emergency physician with a competitive, private ambulance service. He aced three days of practical exams, including use of an automatic external defibrillator, a device he saw for the first time in our course. The story could stop there: the new skill set leads to a prestigious job. But Augusto, like so many of ATL's students, is a rising leader and change maker. After getting hired, he immediately began finding ways to improve the service. When he noticed that their call center would hang up after receiving an emergency's location - a practice that endangered patients and put first responders at a disadvantage - he built a training program to teach the dispatch team to talk callers through an emergency. Today, dispatch remains on the line until responders arrive, instructing callers on steps like how to begin CPR, perform rescue breathing, or control bleeding. Augusto's initiative is making a critical difference: in a recent cardiac arrest, dispatch instructed the caller to begin CPR and to continue until the company arrived. The quick action kept blood flowing to the patient's brain during the vital minutes that responders were en route. Once on scene, Augusto and his team provided advanced treatment, and the patient survived. Augusto's innovations are not only improving medical care, but are also reaching academia. The patient care report ATL teaches its students to use to document class scenarios proved a valuable template for other organizations. With a few tweaks, Augusto put it into use with the company, and it was later adopted as a teaching standard by Universidad Univalle's nursing school in Cochabamba. Leveraging his network in the local medical community, Augusto recently started his most ambitious project yet: building and implementing pre- and intra-hospital protocols for institutions in and around Cochabamba. 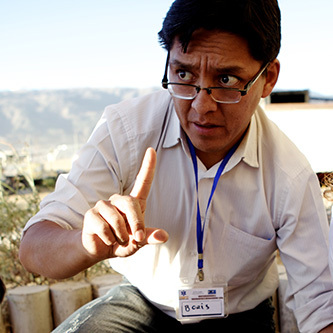 Incorporating standards from courses such as ATLS, PALS, and PHTLS and customizing them for Bolivia's resource base, Augusto hopes to help establish regional or national model protocols. Prototypes should be ready for hospital review by December of 2013, after which Augusto expects a coalition of hospitals and other emergency service providers in Cochabamba to adopt the standards. An admirable initiative with vast implications, these protocols can help establish a level of standardization currently lacking across Bolivia. Augusto's vision and dedication have not gone unnoticed. Being highly respected among his colleagues, many have asked that he share what he learned with ATL. Additionally, several of the physicians and nurses he works with have asked to enroll in our future programs. A Tu Lado's June 2012 course gave Augusto an initiation to the field of pre-hospital care and emergency medicine. Less than a year later, that spark has turned this physician into a leader in the field. His initiatives save lives and impact both universities and companies. Who knows how many other students are waiting for their spark? As a student, Boris Castellon Castilo sometimes dreamed of trading his future in Bolivia for a more comfortable life abroad. Instead, he rooted himself in Cochabamba. As faculty of Universidad Mayor de San Simón Nursing School and a nurse in the San Juan de Dios Psychiatric Institute, he is well-known throughout local institutions for his medical skill and compassionate nature. Boris is also a graduate of A Tu Lado's (ATL) June 2012 "Intro to EMT" course, an experience which he has put to great use. During our interview in March 2013, Boris reflected on his experience at San Juan de Dios, one of the largest psychiatric hospitals in Bolivia. He recounted how patients sometimes died unnecessarily from aspiration and airway emergencies, simply because staff were unprepared to respond. Despite confronting frequent, treatable emergencies, Boris found himself as the only employee concerned by the lack of training. He already had many of the skills to treat an emergency patient (from prior experience in the Red Cross), but during his six years working at the hospital, he struggled to convince his peers and superiors that emergency preparedness should become an institutional priority. "I had lost hope," Boris told us, "until I took ATL's course." Since graduating from our program last June, Boris says that he's been more motivated than ever. As a result, his campaign has gained a critical mass. With newfound support from the administration, he and his colleagues are setting up an airway management training program for the entire hospital staff, while also building the protocols and logistics to coordinate their response in emergency situations. For the first time, Boris is optimistic that the hospital's patients will soon receive the critical care they need. While teaching in the nursing school, Boris often sees students hoping to find lucrative jobs abroad. But what Boris has learned from his own journey has him determined to keep talented Bolivians in Bolivia, where they can help advance the country's medical field. It's a cause close to his heart, and one he hopes to emphasize when he becomes the director of the Nursing School, his long-term goal. Elvia is no newcomer to paramedicine. She joined SAR (Salvamiento y Rescate, Save and Rescue) Bolivia, as a teenager in 2005 and is now known for her passion for volunteering and love of parachuting into remote rescue operations. She built a specialization in search-and-rescue and pre-hospital care by completing an array of courses in Bolivia and one in Chile. Most, she says, were crammed with students, and offered little to no continuing education after the course was finished. When she heard about A Tu Lado's June 2012 course, she jumped at the opportunity. "I liked that there were people from different institutions," she told us in March 2013, "because you learn from each other. That's important, because all the different procedures can merge into one." She explained that before our course, she had never encountered standardized steps for taking patient history, or ways to conduct patient interviews chronologically to ensure no key details are overlooked. After learning these steps in our hands-on, practical scenarios, she now sees the systematic and orderly approach as integral to high-quality patient care. Elvia knows first-hand the importance of forming locally-sustained programs with universities. She's seen the difference our training has made for herself and her colleagues. As a result, she's become a valuable ally and advocate for ATL. During our March 2013 course, she helped coordinate and supervise practical scenarios, always eager to help students master each step in the patient care algorithm. She appreciates how A Tu Lado's work is part of a larger context - how she and many others across Bolivia take inconsistent and sometimes contradictory courses, and yet the graduates are considered paramedics indefinitely. "If there were a program for paramedics in the university, it would be fantastic. The only institution doing training is SAR." 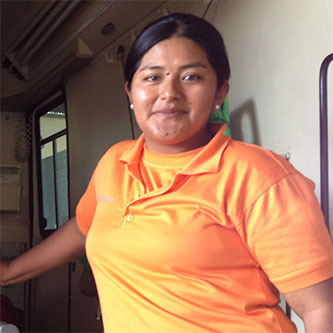 As former coordinator of logistics, budgeting and scheduling, Elvia understands the challenges faced by pre-hospital care providers in Bolivia. "They think that once you have taken a course, you are qualified to be a lead instructor," contributing to the lack of standards, she told us. "A standardized pre-hospital certificate could reduce inter-institutional conflicts," she said, while explaining why she's such an advocate for our work. When not in uniform, Elvia spends her time studying for a graduate degree in customs management and exports. Later this year she plans to find a job in another department (state) of Bolivia, where she can expand SAR's local presence, and perhaps help A Tu Lado partner with a university in another region. We know that wherever she goes, Elvia will work to promote a culture of volunteerism and quality care. Considering her track record, we are confident she will have success wherever she is.